While its celluloid counterpart is banking on flashy special effects and newfangled 3D technology to draw in moviegoers, Avatar: The Game entices players with promises of depth and thoughtful storytelling. Ubisoft sets the stage well, presenting a lush, foreign planet amidst an interspecies war, where the player must decide which side to fight for, and ultimately, which side will win. After playing through the game as both the humans and the blue-skinned na’vi, I can honestly say that choice hasn’t been overstated; with different gameplay mechanics, storyline twists, and environments to explore based on your affiliation, Avatar is essentially two games in one. The only problem? Neither of them is very good. In the first few missions you play as Ryder, an unremarkable human working for the Resource Development Agency on the planet of Pandora. These first simple tasks introduce the basic weapons and abilities of the human character, while the missions that follow show off your Avatar, one of the na’vi aliens you control via good old sci-fi hocus pocus. The Avatar sections provide the game’s greatest moments; not only do you get to see the wide range of differences between the characters (weapons, armor, vehicles, and skills all differ), but you are also introduced to Pandora’s large and wildly creative environments. The levels are the game’s best selling point, and you don’t need a 3D display to appreciate their splendor. Just when you are beginning to enjoy your new home, however, you are ushered into deciding between the two factions. From here, the game’s weaknesses begin to surface. In my first playthrough I sided with the na’vi. Their size and nature-based powers (including the ability to summon fauna to attack enemies) make them feel powerful, but their tribal society is no match for the RDA. How well do you think armor made out of animal hides and blades made from bones stack up against bullets and missiles? Not well, and the game doesn’t avert this reality for the sake of fun, either. The na’vi use melee weapons even though their gun-toting enemies are always out of range, resulting in cheap deaths made all the more insulting by the brain-dead AI. Playing as the RDA is a little more exciting – you have a wide variety of guns at your disposal, and ammo is plentiful. The vehicles are also varied and more fun than the na’vi alternative – animals that scream as they get mowed down by your enemy’s heavy artillery. Despite a few entertaining moments that come from blasting apart the jungle Predator-style, the human faction doesn’t offer gamers anything they haven’t seen before, either. Avatar’s biggest problems lie with the narrative. The moral choices are more black and white than the developers would like to think, and while seeing the story from both sides is interesting, the missions are so mind-numbingly bland you won’t want to play through a second time. Avatar boils down to an unending string of pointless fetch quests, with NPCs barking more insults than explanations as to why you’re collecting/killing something for the umpteenth time. The infuriatingly bad endings are the icing on the cake. Play as a na’vi, and your final mission requires walking into a glowing circle and pressing a button to watch the non-interactive end scene. Play as the RDA, and you’ll suffer a cheap boss battle followed by a nonsensical explanation of your actions that renders them pointless – and not in a Full Metal Jacket, pointlessness-is-the-point sort of way. It’s just plain broken. These shortcomings are a shame considering the game’s interesting gameplay twists. 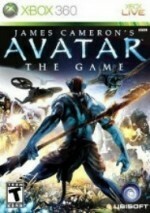 Avatar features a solid RPG element that unlocks new armor and upgraded weapons at a steady pace. Players also unlock new skills (i.e. buffs) that help spice up combat a little, but can’t overcome the gameplay imbalances. A standard set of multiplayer options are also included, plus a turn-based strategy meta-game that awards permanent boosts to your character in the main campaign. These innovations offer much-needed depth and enjoyment, and point to interesting avenues for future genre mash-ups. In the end however, these extra layers can’t fix the subpar combat and disappointing storyline at the game’s core, leaving Avatar a lackluster, though not entirely unpleasant, experience. While forgiving sci-fi fans might still appreciate this intergalactic romp, the average gamer is left with an easy choice: this game is a rental at best. Ubisoft successfully delivers two games in one – the only problem, is neither of them is very good.